Promising power and processing tools to satisfy even the fussiest of engineers, A&H dLive is designed to pick up where the much-loved iLive left off, which is no easy feat. Alistair McGhee takes it for a spin. Allen & Heath has been making waves in the digital mixer world for quite a while, mostly of late at the more affordable end of the market where the GLD and Qu series have been attracting a lot of attention and well-deserved acclaim. 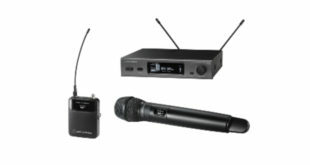 Above these two newer product lines the iLive series has long established itself as a solid option in the live world with great interconnectivity and a reputation for excellent sound quality and solid reliability. Now A&H has revealed the iLive’s successor: the dLive, building on the hard-won success of the iLive series while raising the bar in just about every area. There are three new dLive surfaces: the S3000 with 20 faders and a single touchscreen (all the dLive surfaces can drive an external screen); the S5000 with 28 faders and two touchscreens up to the S7000 with 36 faders and dual touchscreens. These surfaces can be partnered with any of the new DM MixRacks, which come in 32-in, 16-out; 48-in, 24-out; and 64-in, 32-out (analogue) channel versions. 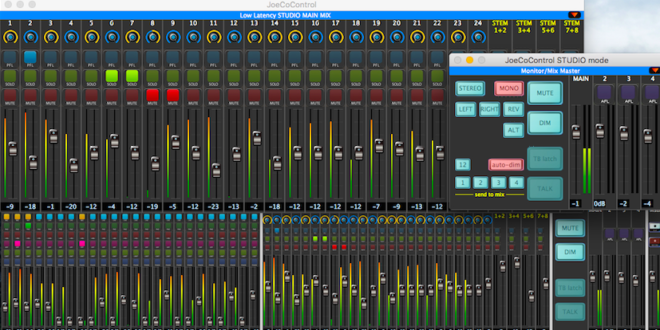 In a dLive system the MixRack houses not just most of the I/O but also the grunt. All three options have the same processing power differing only in the amount of analogue input and output on offer. Each rack can mix 128 inputs to 64 outputs and all at 96kHz. If 64 analogue inputs isn’t enough you add to this via the new DX 32 – this is a 32-channel expander, two of which can be attached to a DM MixRack and one DX32 can also be connected to the dLive surface. Each DX32 has four eight-channel expansion slots and expansion cards are available in analogue in with remote mic amps or analogue out or digital in or out in AES3 format. Further expansion is available through the new I/O ports – three on the MixRack, two on the surface – each of which offers 128 x 128 out at 96kHz. That’s a lot of I/O. And although you can mix 128 inputs, you can route any of the 800 inputs to any of the 800 outputs using the tieline feature, without consuming DSP resources. Game changer. And all this with latency of around .6ms with all processing time aligned. 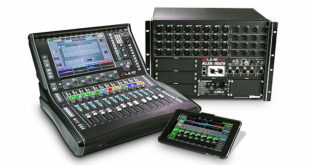 Each component of the dLive system features dual redundant, hot swappable power supplies and the MixRacks and expander offer dual redundant Cat5e connectivity using the new A&H GigaAce protocol. This is a system that takes redundancy seriously. One of the glorious aspects of the digital age we live in is getting 64 channels down a Cat5 – of course one of the worst things about the digital age is putting all your eggs in one Cat5 basket. So when the show really, really has to go on then two Cat5s really are much, much better than one. I pulled one GigaAce out and the dLive didn’t miss a beat, I’m pleased to report – the show goes on. I got a bit cocky, so I pulled both out, and then quickly plugged one back in and in under two seconds there was audio running and the surface responding as normal. Neat, eh? And in a clever bit of thinking all the surfaces, MixRacks and expanders share a common PSU design. 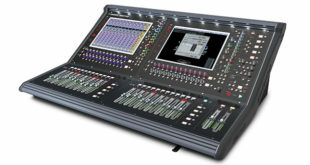 The touchscreens on the dLive are seriously nice bits of kit – dimmable for you theatre guys, and daylight bright. They respond beautifully to the touch and with pinch zoom and swiping options they are intuitive in operation. Surrounding the screens are encoders with embedded multicolour LEDs that change colour to reflect the controls available at any given moment. The lefthand screen is dedicated to processing. Here, the channel strip is presented in blocks adjacent to the controls at the screen edges – left, right and bottom, with the centre section available for the detailed information of what you are working on. The righthand screen is your system screen – here you can handle I/O, set up the surface and MixRack and work on routing and meter presentation. On the processing screen the centre detail section is tabbed and defaults to the bank view of showing the overview of the bank of faders (12 or 8) in which your selected channel lives. Next, you have a global overview of the channel and then individual sections, preamp (including routing and the ability to remove the preamp gain from the surface – when you’re sharing the preamp with monitors), filters, dynamics etc. However, while the centre section changes the two ‘cheeks’ and the ‘chin’ remain fixed, so your preamp settings are always visible on the left cheek and on the right you get to pick three options from a set that includes your dynamics, your sends and your effects. Just hit the Setup button and any configurable sections of the screen displays Setup mode and you have access to your options with drag and drop where applicable. The bottom section of the screen has configurable views of EQ and an option to view metering. Your curves can be controlled by the respective controllers or by the touchscreen. It’s options and flexibility galore. The really clever bit is allowing you all that configurability and then allowing you to nail it down for repeatability. Ben Hammond, who was giving us the once over on the desk, always had the main vocal compressor settings visible on the righthand cheek of the Setup screen (which is also divided into a central detail area and three panels: left, right and bottom) and similarly always has gate, compressor and FX sends on the three pages for the righthand cheek of the processor screen. Everywhere drag and drop offers fast and flexible setup. We had some guys from local PA outfit AB Acoustics over and we discussed building layers on the fly while mixing – something they do at the moment with pop group functionality, and the dLive has the same trick by allowing you to configure layers using drag and drop on the system screen while leaving the layer you are mixing on and the processing screen to carry on as normal. The huge flexibility of the desk is visible in areas like setting up sends to mixes. Hit the Mix key on an aux and the channels flip to the Sends on Faders we all know and love. Tired of that, use the Sends option in your processing screen – one button or swipe away – on your selected channel or hit Sends on Rotary and use the option to switch off Sends on Faders. Here you see the mighty leaps Allen & Heath has taken in desk usability – when I looked at speccing an iLive for a job six or seven years ago, the rotary did anything you liked as long as it was pan. Now it does gain (preamp or trim), pan, sends to selected mix or one of four customisable buttons with access to a myriad options. And, for a slightly different cat, set the custom rotaries as sends to your first four aux busses and you have an alternate workflow option. Another area of improvement is the MixRack speed. The first choice you have to make is configuring the MixRack for the number of groups/auxes and matrices you need. These can all be mono or stereo. So if you want a 52 mono aux setup, you can have it, and when you have chosen the right layout for the gig, reboot the MixRack to present the new configuration. I tested it with audio running through the desk – don’t try this at home – I lost about two seconds of audio and the whole system will be back up in less than 15. Shows and scenes are comprehensively catered for and crossfades have been implemented between scenes. You have up to 20 seconds available for cross fades and dedicated buttons for operation, including a nice big GO button. And your scene list (or set list!) is always available in the lefthand cheek of your system screen. Save out your show files to a front panel USC socket; a second USB on the front panel allows stereo playback and stereo recording. Summing up is difficult when so much has been left unsaid: 24 DCAs; copy and paste channels; freezing inputs down layers; pinch zoom on the I/O assign matrix – a function for 50-year-old eyes; assign all your inputs by dragging your finger at 45º across the I/O screen in two seconds; unlimited stereo input ganging and 16 multi-input gangs on the surface; four custom meter pages (please can I have the custom meters that auto widen to the screen – it’s a 50-year-old eye thing); use your iLive interface cards with adapters; iPad control and system editors coming soon; build quality is very fine and all the fixtures and fittings cry out quality. One of the most successful aspects of the desk is the control count – large enough to give you lots of instant access to tonnes of features but avoiding the forest of knobs that induces indecision as you reach for the control you need right now. I think the numbers will sell dLive – the sheer amount of I/O and processing will surely attract the theatre market – but I also think the workflow will sell dLive; it is usable in a way that makes engineers’ lives easy, and let’s them have it their way. Allen & Heath’s dLive is an ergonomic triumph, in fact the whole system is a Triumph – a big beautiful Bonneville sort of Triumph. Iconic British engineering at its best.